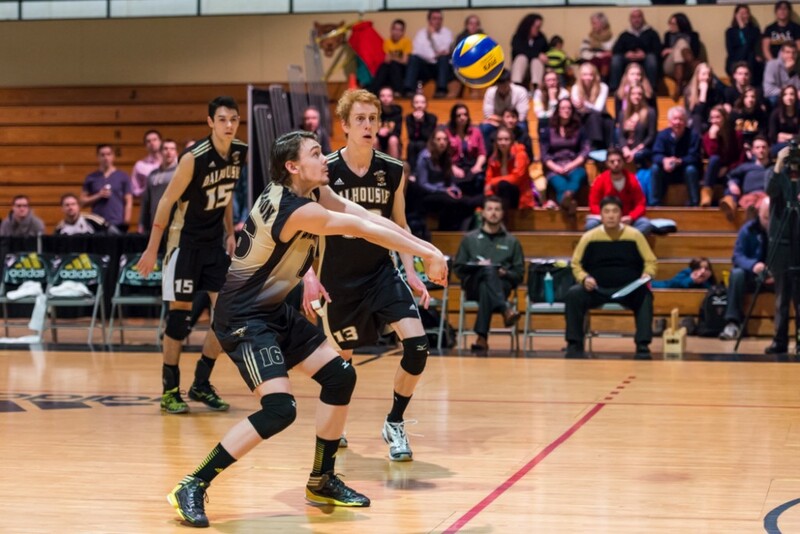 In what has become an Atlantic University Sport (AUS) tradition over the past 10 years, Dalhousie is squaring off against the University of New Brunswick for the men’s volleyball title. The Tigers entered the final in first place with a 13-4 record to give them home court advantage in the best-of-three series against the defending champion Varsity Reds. It took a fifth and deciding set to determine the winner on Feb. 7, with the Tigers taking the first game of the AUS championship series 3-2. The Munro Day match provided fans at the Dalplex with a tight battle, with the Tigers and Varsity Reds alternating 26-24 set wins to open play. The Tigers failed to capitalize on their game point in the second set, surrendering four straight points to lose the set. The Reds started the third start strongly with a five-point lead. A timeout by head coach Dan Ota got the Tigers’ composure back, and they were able to take the third set 25-21. However, UNB answered back in the fourth set and tied the game at 2-2 with a 25-20 set win. The Tigers won the deciding set 15-12 courtesy of a couple of aces by Jonathan MacDonald and Connor Maessen before Kristen O’Brien took the match point. The Tigers took Game 1 of the best-of-three series and saluted the home crowd. Game 2 of the series will be on Feb. 15 in Fredericton, with the Tigers hoping to retake the AUS crown they lost last year.